Although a date has not been set, the hearing could come as early as Monday, March 12, 2018. According to the Bozeman Daily Chronicle, the three protesters (Thomas Brown, Cody Cyson, and Hanna Ponder) were charged with misdemeanors after entering the Stephens Creek Bison Capture Facility in northern Yellowstone National Park. Brown and Cyson were given additional charges for “interfering with an agency process,” namely locking themselves to the Stephens Creek squeeze chute, where staff take blood samples from bison in the facility. The charges carry a maximum penalty of six months jail time and a fine of up to $5,000. All three appeared without representation, although the Chronicle reports the trio are working to secure attorneys. The three appeared in court Wednesday morning, and U.S. District Judge Mark Carman granted the U.S. attorney’s request for a continuance until Monday and that all three remain in custody until a detention hearing. No pleas were entered. Carman said the factors the court considered in choosing to keep the people in custody were whether they were dangerous to society and whether they are likely to run from the court’s jurisdiction. The trio arrested belong to a bison advocacy group named Wild Buffalo Defense (WBD), a collective that seeks to highlight living conditions for bison in Yellowstone National Park and protest their current treatment. The group took credit for the chute incident in a Facebook post. The trio were also accompanied by a larger group bearing signs in protest of the hunting and slaughter of bison. Brown is a former volunteer for another bison advocacy group, the Buffalo Field Campaign (BFC), which issued a statement of solidarity with Brown and WBD. These arrests come on the heels of a pair of incidents earlier this year, when bison being kept at Stephens Creek were released through cut fences. The first incident happened in January, with 52 bison escaping. The second incident happened in February, when over 70 bison escaped, although most returned before crews patched up the fence. 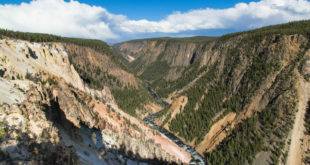 In response to these fence cuttings, Yellowstone officials announced they would increase security around Stephens Creek but has not released any details. Yellowstone bison are hunted and slaughtered under the Interagency Bison Management Plan (IBMP), which seeks to keep bison numbers at or below 3,000 and prevent their movement outside the park, where cattle managers fear they’ll spread brucellosis to their herds. Although there has never been a documented case of bison-to-cattle brucellosis transmission and new research shows elk are a greater danger for spreading brucellosis, bison still endure the brunt of management. As of last summer’s count, there were approximately 4,800 bison in Yellowstone National Park. This year, IBMP officials hoped to cull 600 to 900 bison. In recent years, Yellowstone officials have proposed establishing a quarantine facility at Stephens Creek, where bison could be cleared of brucellosis and shipped to other herds around the country. Yellowstone had previously solicited public comment and hosted open houses on quarantining. Although quarantine has found support among some environmental orgs and tribal entities, it is fiercely criticized by groups like WBD and BFC, which see it as an attempt at domesticating bison. Indeed, the 52 bison who escaped in January had been kept in quarantine at Stephens Creek for one to two years. Federal regulations hold bison must stay in quarantine for at least two years before they can be certified brucellosis-free by the U.S. Department of Agriculture. The park has advocated quaranting both as as an alternative to slaughter but also because of promises made to the Fort Peck Indian Tribes in eastern Montana, which has sought to establish its own herd. Last winter, 40 bison being kept at Stephens Creek were nearly shipped to slaughter to make room for others. After Montana Governor Steve Bullock intervened, state, federal and tribal officials negotiated for the park to retain 24 bull bison, which would be shipped to Fort Peck after undergoing quarantine. These 24 bison were among the ones who escaped Stephens Creek in January. 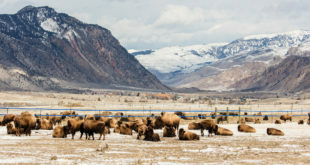 Alongside this push for quarantining Yellowstone bison, the agencies under the IBMP have sought to update the plan, which has been effect since 2000. Thus far, however, all attempts to update the IBMP have ended in stalemate. Bison management has always been a contentious topic around the Greater Yellowstone Area, but this year it has become especially fraught. The Blackfeet Nation, for instance, announced they would be sending hunters to the annual hunt after the state of Montana recognized their treaty rights to hunt bison. Shortly after, the Crow Tribe announced they would seek to assert their treaty rights as well. With the addition of the Blackfeet, six Native American tribes currently hunt bison outside Yellowstone National Park each winter, prompting criticism from some residents and Montana wildlife officials who think the area is too congested. Although bison have been gradually permitted to roam outside park boundaries, they’re still relatively hemmed in. Outside the hunting season, bison who stray too far toward the limits of the “bison tolerance area” are hazed back. Last week, a Bozeman law firm sued to block hazing north of Gardiner, Montana, arguing that it constitutes a public safety hazard, which could be avoided if bison are allowed to move north into the Paradise Valley. Finally, a larger legal matter is looming on the horizon for bison management, following a court decision made earlier this year. In early February, a federal judge sided with bison advocates against the U.S. Fish and Wildlife Service (USFWS). The judge ruled the agency had not adequately considered a pair of petitions for Yellowstone bison to be listed under the Endangered Species Act. The agency now has until approximately May to review its decision and issue a new finding. If the USFWS rules Yellowstone bison warrant protections and inclusion on the Endangered Species List, it would change everything about current bison management, to put it briefly.